Sappi Speciality Papers has announced the introduction of atelier, a new folding box board (FBB) that broadens Sappi’s offering in terms of both width and depth of coated virgin fibre carton boards for the packaging market. atelier is a hybrid FBB product that is available in weights from 220 gsm to 350 gsm and is being produced at the company’s Maastricht mill. 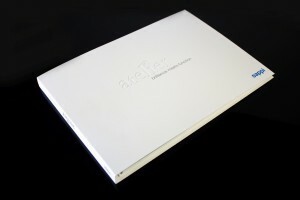 atelier is a multi-ply board produced on a single-wire board machine; it delivers the ultimate in brightness, purity and gloss with a silk touch and feel and unrivalled bulk. With a brightness level of 99% on the top side, atelier exceeds the market standard in brightness compared to a current industry top value of around 92%. On the reverse side, it offers a brightness factor of 98% to accommodate the increasing demand for printing on both sides of the board for added impact. Prior to developing atelier, Sappi Europe performed extensive market research, identifying the top folding box boards from leading European suppliers. “At a minimum, we wanted to be in line in terms of the physical properties, including rigidity, bulk and strength, while going beyond today’s known visual properties,” explained Lars Scheidweiler, product group manager rigid packaging of Sappi Europe. “At the same time we aimed at bringing tangible and purely unique characteristics to folding box board that would clearly set us apart in the marketplace. Headquartered in Brussels, Belgium, Sappi Europe SA is the European producer of coated fine paper used in premium magazines, catalogues, books and high-end print advertising. Its graphic paper brands include Magno, Quatro, Vantage, Royal, Galerie, GalerieArt and Jaz ranges. Algro, Fusion, Leine and Parade are the brands for speciality labelling, topliner, packaging papers and boards.